Tired of dirty, wet paw prints all over your house? Joanna Rein remembers feeling that way. Despite stockpiling rags and towels by the backdoor, her four young kids could never tackle their dog Buddy’s wet paws when he came in from the yard. She wanted an easy way to clean and dry Buddy without creating a huge mess, and she was inspired by two things: the tiny chamois towel she saw a swimmer using at a swim meet, and the soft, dangling brushes in a car wash. It took some experimentation (and help from a patient tailor) before Joanna perfected a simple, practical solution for wet paws that even Buddy likes using. 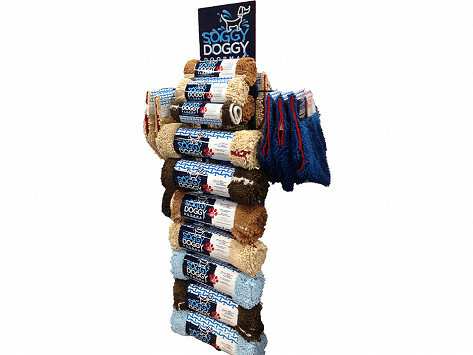 The secret is in the “noodles,” the textured strands of microfiber chenille that are woven together to create Joanna’s Soggy Doggy Doormat and Soggy Doggy Super Shammy. These shaggy textiles soak up water and trap dirt like a sponge. And they really work. The doormat can absorb 5 times more water than a regular cotton doormat, and it easily doubles as a crate pad, car mat or couch cover. The Super Shammy—which has hand pockets so you can get a firm grip when you’re toweling off your pooch—can hold up to seven times its weight in water.